I write about cats and critters, music and people and stuff. And cats, did I mention cats? Remember back in the early golden days of the movies when a gang of neighborhood kids would be playing in someone’s back yard and one kid (such as Judy Garland or Mickey Rooney) would get a brilliant idea and shout, “Hey, kids, let’s put on a show!” These productions were always scatterbrained and silly yet everyone had a grand time and in the movies back then everyone always lived happily ever after. Well, once upon a time there was an awe-inspiring author who wrote charming stories about a guy in Seattle and a clowder of cats and kittens who were world famous on the Internet. 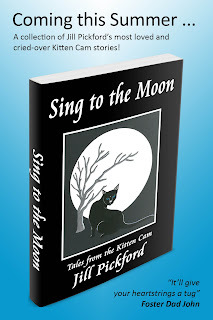 A number of the fans of these cats and kittens and these charming stories wished that there could be a real honest-to-goodness book, printed on real paper in the time-honored fashion, a book you could hold in your hands so the stories could be read again and again (even if there was a power failure). There was a shout, “Hey, kids, let’s make a book!” The magic wand was waved, the incantation was recited, and voilà—“Sing to the Moon” by Jill Pickford popped into existence! But perhaps I exaggerate a tad. It may not have been quite as simple as that. Let’s go back in time and tell this story from its beginning. Jill Pickford began watching Foster Dad John’s Critter Room on Livestream with Rosemary’s Spice Kittens in the Fall of 2012. Several litters later, by the Spring of 2013, while watching Kari’s Mythbuster litter, her first story was born. She shared this with FDJ’s Critter Room Facebook page and everyone who read it loved it. The fandom began. More stories came along now and again—Jill was carefully developing and slowly unveiling a complete mythos, with a cast of characters (feline and human) spanning recorded history, the cosmos, and kittens on the Internet. It was a mesmerizing world, causing readers to both laugh and weep (ofttimes both at once). By November of 2015, The Critter Room was celebrating its Golden Jubilee—and John had raised and nurtured well over 200 cats and kittens in The Critter Room. Through his sponsoring shelter (Purrfect Pals in Arlington, Washington) most of them had been adopted into wonderful forever homes and a majority of the ones who had been on the Kitten Cam had their own Facebook pages. Many more delightful stories followed from Jill's fruitful imagination. The richly embroidered fantasy world she envisioned slowly expanded and coalesced into a continuing story line, taking place on both the earthly plane and in the spiritual realm on the other side of the Rainbow Bridge. 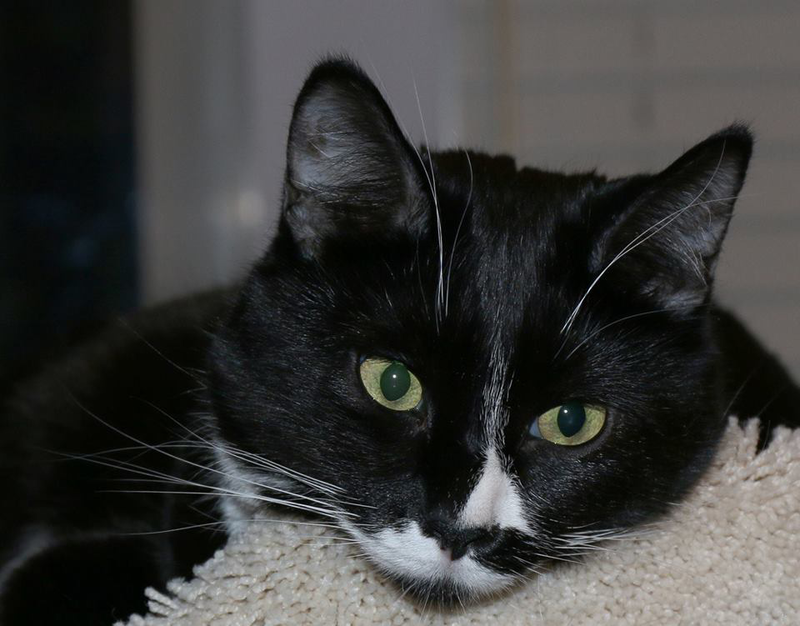 In addition to FDJ’s cats and kittens finding perfect forever homes, and these heart-warming stories being written, another unexpected phenomenon was unfolding. A wondrous group of people from all over the world were getting to know each other, first through their computers and phones and tablets, and then many met in person at a series of yearly Kitten Cam Cons, taking place initially in Seattle, then several European conventions—and next, who knows? Kitten Cammers will take over the world! But back to our timeline: February of 2016—enter Nancy, one of Jill’s most ardent fans, who wrote her the following message on Facebook: “I am sure you have been asked, but is there ever a chance that you will compile all your fantastic writings into a book that could be printed and sold to benefit Purrfect Pals? #patientlywaitingfirstinline"
This exchange resulted in the setting up of a small and private Facebook group for a handful of us to explore the possibilities of bringing Jill’s book into fruition. As I had had some experience being a “content and continuity” editor for an author friend, I volunteered my services as editor. I also said I had some ideas for a cover. Susan, as a multi-talented and accomplished author in several fields (Susan's website, Be As One), volunteered to do the formatting and layout and publishing stuff. 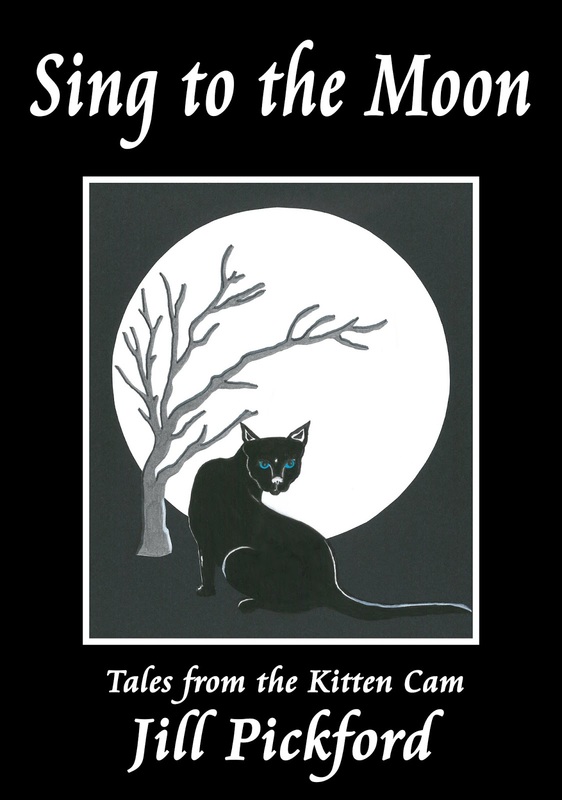 Here is the link to her book inspired by Foster Dad John’s kittens and cats: The Critter Room Memory Book. Nancy cheered us on with wise observations, gentle urging, and barely contained excitement. With fewer than a half a dozen active members in our Facebook group, it is astonishing how many posts we generated in a year’s time. We discussed every single facet of the book-to-be, from Oxford commas to em dashes and ellipses, when to capitalize Moon, the whole babbies versus babies discussion and the stirring ‘dopshun versus dopshun debate—not a single word or a punctuation mark escaped our fierce scrutiny. An early decision was to keep Jill’s British spelling but change the punctuation to American (with one tiny exception). “Hey! We ought to find people to illustrate the stories!” “What a great idea! There are loads of Critter Room fans that have created amazing artwork.” After putting the word out, we were disappointed to receive only a lukewarm response. But hey, it was understandable, folks were busy: working for a living, studying for degrees, raising children—you know—life got in the way. 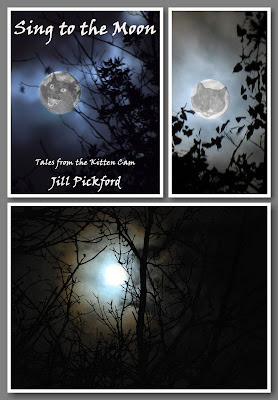 I began working on the cover, starting with some full moon photos I had shot. For six months or more I spent the nights of every full moon out in my driveway with my cumbersome Nikon D80 and my dad’s rickety old tripod (stabilized with an rusty antique flat iron hanging from a bungee cord), trying to achieve the perfect photograph that matched my vision. At times my moon shot seemed almost within reach, but I just could not get it the way I saw it in my head. Mother Nature kept raining on me, beclouding my sky, or blowing wind at my trees and by the end of the night the muscles in my neck would be twitching and my eyes would be crossed from trying to peer into the viewfinder (I have grown way too accustomed to LCD screens on my newer my little point and shoot cameras). With only a few semi-suitable shots in my computer I began laying out the cover. I envisioned a cat face within the moon. 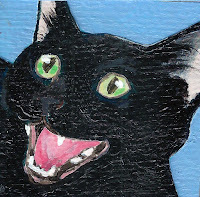 The first cat image I found was Suzanne Hoag's painting of Alice (Hitchhiker Mom) who looked to me like she was singing. Alas, it was decided she looked too scary, as if she were growling. Back to searching through FDJ’s Critter Room alumnae photos. No luck. Enter Mister Ripley. We had earlier convinced him to write a foreword for Jill’s book and on Ripley’s Facebook page he posted a great shot of her that would be perfect for the cover. He was kind enough to send me a hi-res file. I cut it out in Photoshop and placed it into the moon—but to my dismay, no matter what I did with it, it just did not work. But I continued to tinker with the layout and if nothing else, I found a perfect font for the title. 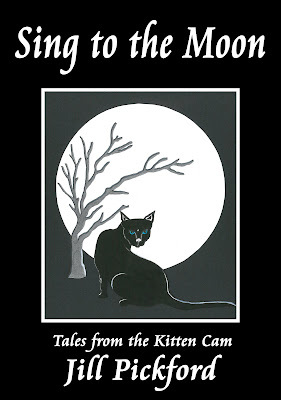 How can a book of cat stories miss with a font called Cataneo? 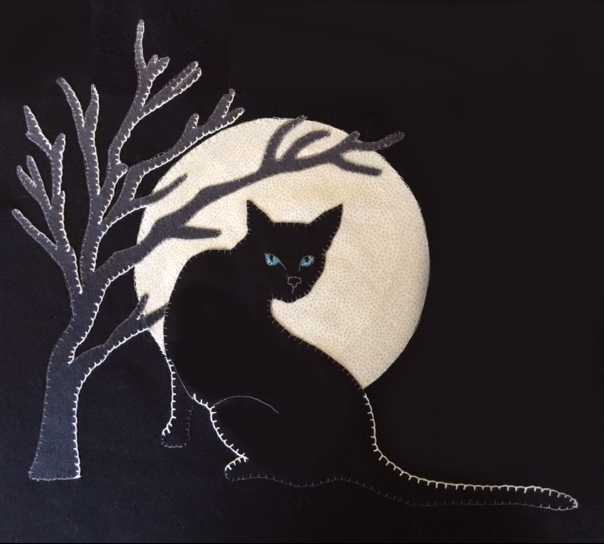 In the meantime, Jill had created several appliqued and embroidered covers for throw pillows with a variety of cat and moon designs. She packed them up and mailed them to Purrfect Pals for their Black Cat Ball auction in the Fall of 2016. The only photos she had taken were not book-cover reproduction quality, so I tried my darndest to reach the liaison from Purrfect Pals who had been the recipient of the package so she could take a good photo our chosen design. Unfortunately, by the time she received my frantic message, the pillow covers had already been stuffed, sewn up and plumped, so thus trying to take a good photo was pretty much out of the question and the auction was on and the pillows were sold and gone. Jill responded by sitting down with a sheet of paper, some markers, and a large plate (to trace around for the moon), and re-created the pillow design. It was then that she also shyly admitted that she had been doing some simple illustrations for her stories. When she shared them with us we were blown away—our author has been twice blessed to be not only a talented writer but a whimsical artist as well. Her drawings were absolutely perfect for her stories and it was an easy project for me to turn her marker drawing into a striking cover. Ta da! The finished cover! As soon as the cover design was solidified, Susan leapt into action and designed a postcard with "how to buy this book" information that could be used for publicity. By the time the holidays were over and we were into 2017, real editing began in earnest. Emails, messages, and Facebook posts flew back and forth around the world, discussing and debating every single question about encountered grammatical quandaries, spelling conundrums, or punctuation dilemmas. 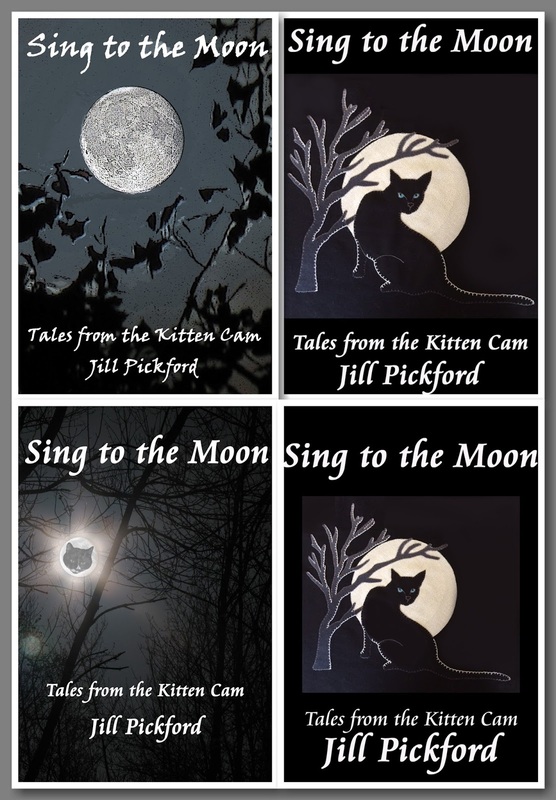 Continuity was our main concern; as Jill had written these stories and poems over a span of several years, it never occurred to her that folks would be sitting down to devour all of them together in book form. They had to be perfect. When it was as perfect as it could be in this first go-round, I sent the Word doc off to Susan (who had been ever so politely hinting that we had better get a move on) for formatting. Susan began working with Word in Create Space and transformed our document into a PDF, carefully setting up margins, gutters, and making sure there were no dreaded widows or orphans or unwanted hyphens. It even had a Table of Contents! It looked so impressive (especially with the addition of Jill’s illustrations). It was starting to look like a real book! We read through this PDF, each finding a few more spelling questions or typos or missing or misplaced punctuation marks. Back and forth the document went to Susan, who most skillfully fine-tuned and massaged the manuscript into shape. With each incarnation the number of notated mistakes lessened until finally there were none (we hoped!). Yet another decision had to be made. 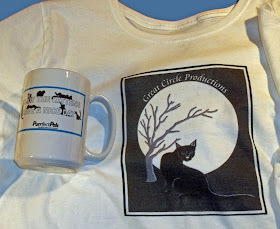 We needed to come up with a name that Jill could use for her publishing house; several names were suggested and after chewing on it for a while we chose Great Circle Productions (once you have read the stories this will make sense to you). The next step was to have proof copies printed up (paid for by our financier Nancy who was, by this time, shall we say, completely over the moon and quivering with anticipation) so we could each go through with our red pencils for one final look-see. 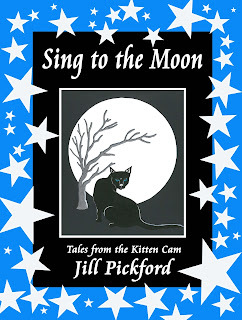 And yes, we each found more errors—but Susan set about making repairs with her usual serene determination and soon “Sing to the Moon” by Jill Pickford was all finished. Had it really been over a year since Nancy first expressed her wistful wish? In the midst of all of our editing struggles, another kid in our gang, after patiently standing in the wings for months (she was getting tired! ), stepped into her long-awaited role in the publicity and merchandising department. Enter Joan, proprietor of the Club Chickenfish Store on Café Press, and she took our designs and ran with them to create T-shirts and mugs (or any of their offerings from their vast array of available merchandise) with the book cover or Great Circle Productions logo and one of Jill’s drawings from the book. Joan also had the large publicity posters (of the postcard front) printed and mounted which will eventually make their way to Purrfect Pals’ headquarters. 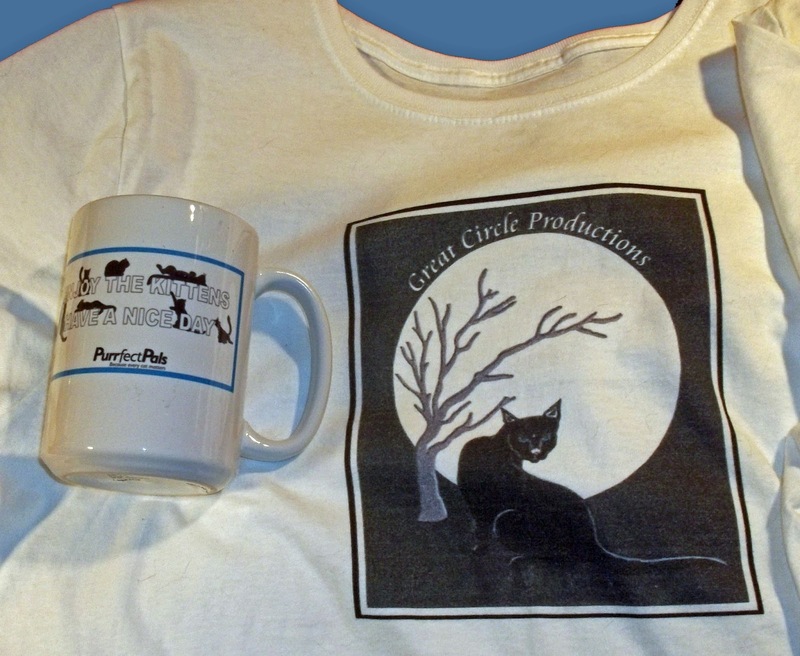 Here is the link to Club Chickenfish where you will find all Critter Room and kitten cam related merchandise, all sold to the benefit of Purrfect Pals. Joan and Nancy will be staffing the Sing to the Moon booth at Purrfect Pal’s annual Average Joe Cat Show on May 6th 2017 at Shoreline's Spartan Recreation Center. Between the two of them they have gone to great lengths to color-coordinate every detail in the display from the large posters to plush kitties, cat pens, and a kitty/moon designed fabric for a table runner. They will be talking up the book, showing the few precious copies in existence (these will be tied to the table!) and handing out Susan's lovely postcards with all of the info on how to order your very own copy of this marvelous little book. 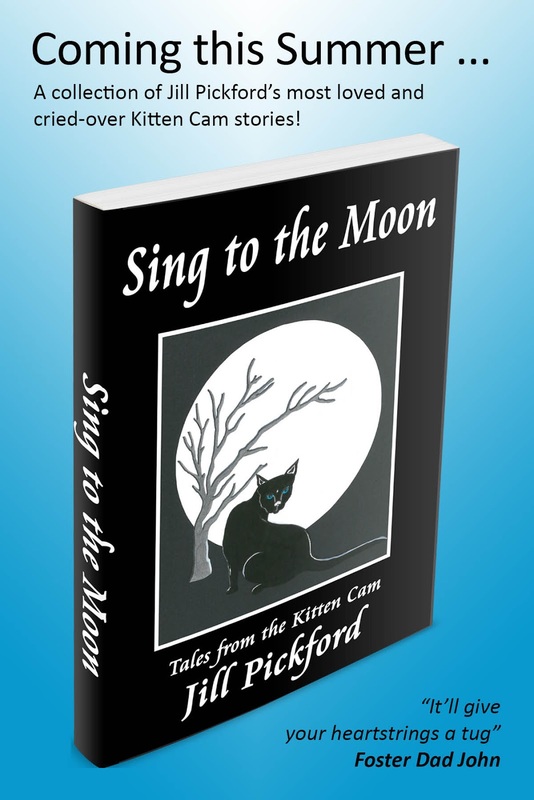 (Keep the postcard—it will make a great bookmark for your copy of “Sing to the Moon”!) And if your timing is right, you may have the honor of meeting Foster Dad John or Mister Ripley in person! Before the book, Jill had been publishing her stories on her own blog called KittenKamKattery. This will be the place to go to read older stories and find new ones, as she writes them. So that is the backstory of how a great guy and a clowder of cats and kittens in Seattle inspired a writer in Colchester, UK, and a small team of dedicated “fan gals” from all over the USA (from Washington State to Worcester, Mass and Tucson, Arizona with Buffalo in the middle) were able to gather in cyber space to produce this little book without ever setting foot together the same room. Wishes can come true.